How long does it take to turn a pile of 50-pound food bags into 50,000 individually-packed dry meals ready for shipment anywhere in the world? Just over an hour, if you have a couple hundred people to help. 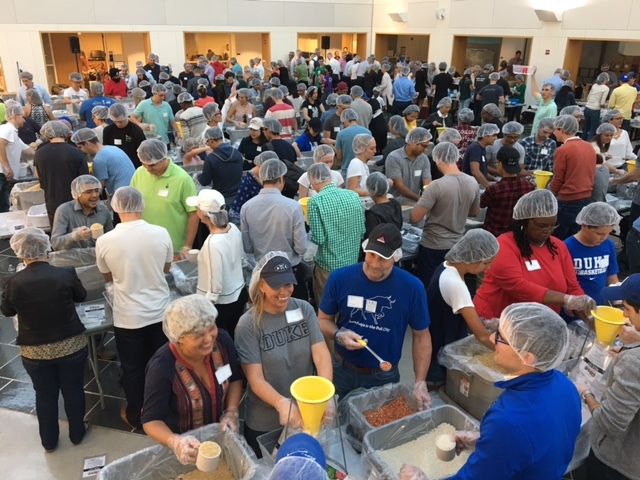 More than 200 students, faculty, staff and their families descended upon Fuqua’s Fox Center as classes ended on a Friday evening in October to pack meals for Rise Against Hunger, an international aid organization that funnels meals and other support to struggling communities worldwide. “It really brings the Fuqua community together,” said Professor John Graham, who brought the idea to Fuqua, along with careers counselor Mary Beck White-Sutton. The pair attend the same church, where the nonprofit – then known as Stop Hunger Now – held a meal-packing event. Shortly afterward, Graham had a realization while standing in the Fox Center. “I thought, wow, we could pack a lot of meals in here,” he said. 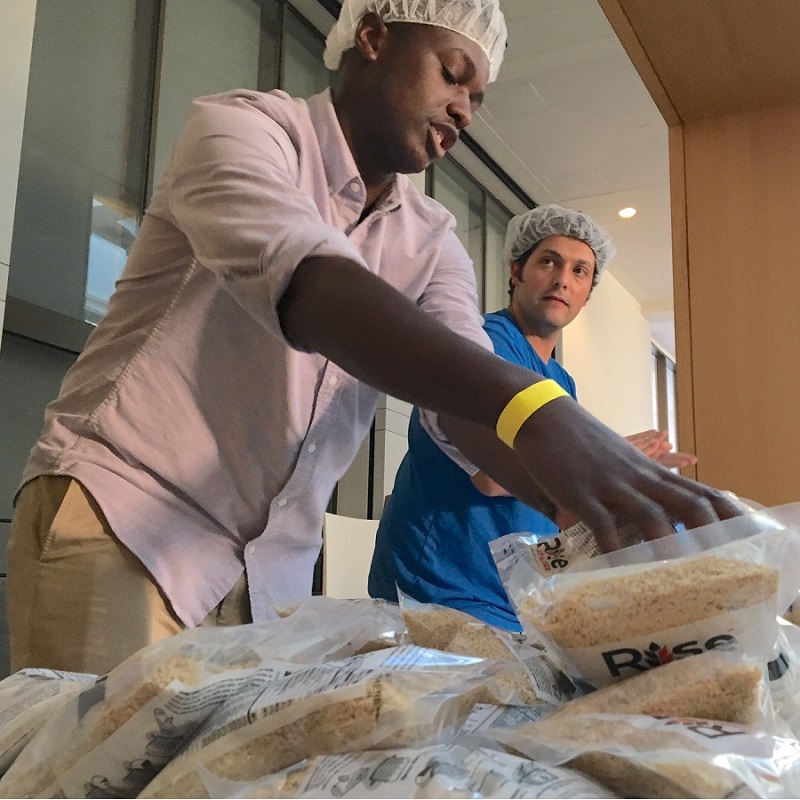 Since then, Fuqua has hosted seven events for Rise Against Hunger, with the help of the school’s MBA Association, which also helps raise the $14,500 donation to buy the meals being packed. In previous years, those meals ended up in Syria, Haiti, El Salvador, Eritrea and elsewhere. This year’s batch could have gone anywhere, but Zack Korges, the assistant community engagement manager who ran the event, said Haiti or Madagascar were most likely. Rise Against Hunger served more than a million people in 2016, spread across 74 countries. Their packing events follow a careful pattern: Food prep stations take sacks of rice, soy and dried vegetables and pour them through funnels into bags that also contain a vitamin pack. Runners take the bags to a station where more volunteers weigh the bags – which must fall between 389 and 394 grams – and seal them. More runners convey the bags to packers, who pile them 36 to a box. Volunteers were assigned to a station, Korges explained the process and then the work started. Every time the bustling production line yielded another 5,000 meals packed, White-Sutton sounded a gong to loud cheers. Tomer Katz and Jeff Wireko, two Daytime students who spent their shift packing boxes, described their involvement as a given. Katz was even more succinct.